What Makes Living Wisdom School Unique? WHAT ARE YOUR HOPES and dreams for your child—not just for kindergarten or first grade, but for the whole of his or her life? Financial security? A good job? A nice home? Happiness? Peace of mind? Love? A sense of empowerment, and an awareness of the greater purpose and meaning of life? What role will your child’s school play in helping him or her realize these hopes? No other influence outside of the home will have a greater impact than the time your child spends in school. At Living Wisdom School, the goal of education is the same as the goal of life: to help children become, on every level—heart, mind, body, and spirit—more balanced, mature, effective, happy, and harmonious. We call this approach Education for Life. 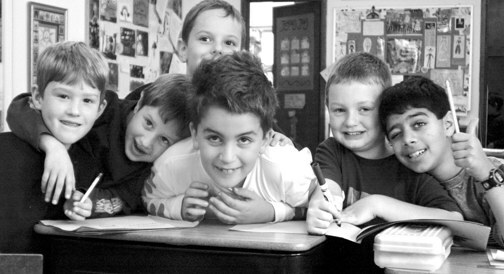 For over thirty years, we have helped children blossom in an extraordinary learning environment. Our students master skills that will help them immeasurably as they grow into adulthood. 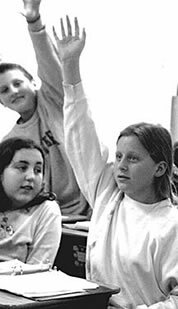 Students learn how to learn, how to ask questions, how to listen and evaluate the answers. Children here learn to take risks and express what they think and feel, in an atmosphere of respect. The San Francisco Chronicle praised Living Wisdom School as a model for an education that lacks the stress so many children experience in school today. Our small class size allows us to give individual attention to every child, every day. We offer an enriched, balanced academic curriculum that challenges the students at all levels of development. Success in life depends on a lot more than just finding a good job. One must also know how to interact and respond successfully to the people and circumstances that life brings. A fundamental goal of Education for Life is to bring each child to true maturity, which we define as the ability to relate to others’ realities, and not only to one’s own. In the process, each student becomes more aware of his or her emotional reactions, under the guidance of skilled teachers. While eternal spiritual principles lie at the core of our approach to education, we do not provide “religious instruction” in the traditional, parochial sense. The focus here is on developing qualities that are universally valued in all religions—-such as inner peace, love, wisdom, and joy. Children of many faiths attend Living Wisdom School, and find that their understanding of their own faith is strengthened by their experiences here. In addition to learning yoga and meditation skills, every spring the children take part in an all-school theater production based on the life of a great person. Through re-enacting the life stories of great men and women, the children discover the potential for greatness that lies within themselves as well. What a joy it is to see bright-eyed, happy students loving learning and deeply understanding what they learn. Within a culture of caring and respect, students tend to bloom in every way, especially in academics. The result is a community of life-long learners. Much of the rote memorization, standardized testing, and hyper-pressure that is commonly applied to elementary school children nowadays is actually detrimental to their long-term development and success in academics and in life. At Living Wisdom School, children are encouraged to become independently curious, enthusiastic, and disciplined in all their endeavors. We prepare our students to do well in standardized testing, and we assign ample homework, but at the same time, we know that children develop at different rates. Forcing a child to learn too fast may constrict or bypass vital stages in his or her development. Other children need to advance more rapidly than usual, and they are given ample opportunity and encouragement to do so at Living Wisdom School. Our low student-teacher ratio makes it possible for each child to receive individual attention, every day. As a result, students are able to thrive, but without the stress that usually accompanies high performance. The annual spring play is a unique example of our interdisciplinary approach to learning. Each child is involved in some aspect of the production, which portrays the life of a towering role model from history. Past plays have told the life stories of Krishna, Jesus, Buddha, Moses, and Joan of Arc. The play becomes an overflowing source of learning in spelling, speech, reading, writing, history, and values. For example, the play Jesus, Holy Son of Mary inspired the children to study Greek and Roman history and mythology, while Krishna, the Beloved evoked rich lessons in the geography, politics, culture, and art of India and the Far East. While they rehearse and study, the children are internalizing the most dramatic, inspiring, and values-rich stories of the world. Thus, they receive, among many other lessons, priceless keys for deciphering the great literatures of the world. Through learning to perform, they practice being poised and graceful. They learn to concentrate, cooperate, receive directions, and take feedback. 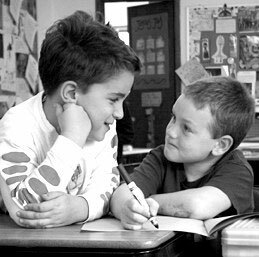 The children receive portfolio assessment and narrative evaluations, both of which are universally recognized by high schools and middle schools. Because our students love learning, they perform well in standardized tests and are accepted by top private schools. In their science classes, the children are encouraged to become scientists. Using the scientific method, they learn from hands-on lessons about the wonder and beauty of the natural world. Field trips, presentations by guest speakers, and vivid experiments make the learning experiences unforgettable. Students study the Physical Sciences, Earth Science, and Life Science. Classes go on regular excursions to the Tech Museum of Innovation, the James Lick Observatory, NASA Ames Research Center, Intel Museum, U.S. Geological Survey, Point Reyes National Seashore, Yosemite National Park, and many other learning-rich destinations. Sometimes, the children are inspired to express what they’ve seen and learned in art and poetry. All students at Living Wisdom School learn basic mathematics skills through the teaching of concepts and experience of games and manipulatives. The program of study is individualized so that each child can proceed at his or her own pace. Children who are able to work at higher grade levels are encouraged to do so. And children who need more time to master a particular skill set are given the opportunity and support they need. We emphasize how mathematical principles can help children in the exercise of ordinary logic. At our end-of-year ceremony, the younger children are asked to stand and tell what they like best about school. Over and over, they say, “I love math!” The after-school Solvers League is popular with the older children and helps prepare them for national math contests. In language arts, the children learn grammar as a gateway to clear thinking and writing. Literature is shared as an expression of great insights into life, human nature, and themselves. Reading is celebrated at all grade levels in myriad ways. Once a year, the school has an All-School Read-In. The children bring their sleeping bags and pillows and cuddle up for an entire morning of independent reading. 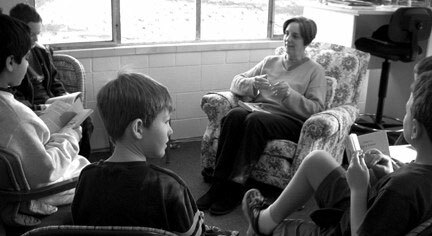 The teachers serve treats, and the older children read to the younger ones. They also play word games and share special stories. The study of Shakespeare is a yearly event, school-wide. The kindergarten might learn “To be or not to be” while tackling the letter “B,” and the primary grades might read a storybook version of A Midsummer Night’s Dream. In the past, the fourth and fifth graders have read an abridged version of Twelfth Night, after which they have attended a local production. Walk into the middle school class and you might find the students reading the unabridged version of A Merchant of Venice in the original Elizabethan English, in preparation for a trip to the Oregon Shakespeare Festival in Ashland. Writers Studio nourishes writing skills in a thousand ways. In spring, a literary magazine offers some of the best of each child’s work, and may include short stories, poetry, expository reports, and essays—-all illustrated with the children’s own black-and-white drawings. Social Studies lends itself to being easily integrated across the curriculum. When the children are studying Shakespeare as part of the English curriculum, their history classes are covering Elizabethan England. As part of their Shakespearean studies, the younger children have made pomanders and horn books, while the older children have learned in detail how daily life in the early 1600s differed from modern life in Silicon Valley, down to the sanitation systems. The production of the play Moses inspired an entire unit on Egypt across the grades. A California history unit initiated a wider study of California’s art and photography, as well as a trip to the Cantor museum, a tour of the State Capitol, and an excursion to the Gold Country. 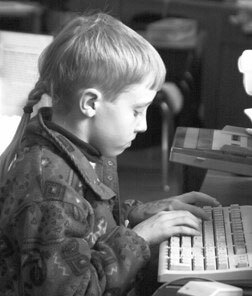 Living Wisdom School prepares each student to work competently with computers. However, we strongly believe that computers are a tool and not a substitute for clear analytical thinking. Researchers have begun to identify delayed brain development in young children whose computer time takes the place of real-world play and socialization. Thus, we introduce computer activities in fourth grade. The students learn word processing and how to use the Internet for research projects. They also become familiar with basic computer hardware, including processors, drives, displays, printers, and digital video accessories. Living Wisdom School is unique in the training that students receive in stress management. The children learn yoga and meditation techniques that have been clinically proven in studies at Harvard and MIT to reduce stress and increase mental clarity. Yoga postures give the student tools for a lifetime of enjoyment and health. 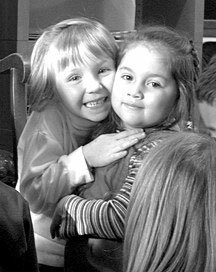 We believe that play and recreation are vital for a child’s social and emotional development. Therefore we make abundant use of a large public park and playing field just a few minutes’ walk from the school. Soccer, basketball, running, and organized playground games provide ample opportunities for teamwork and individual achievement. As mentioned earlier, we challenge the students to participate in a yearly play, performed in spring, about the life of a great person from history. Because of their tremendous enthusiasm for the play, the children are eager to master the challenges of a sophisticated script. 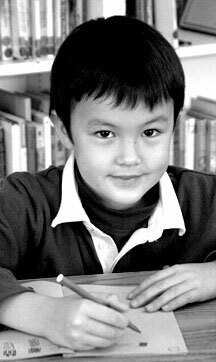 For example, the third graders study the vocabulary of the script as an important part of their language development. In the process, they learn to use the dictionary, and they master “big words” so that they can better understand their lines. During the many rehearsals, the children automatically pick up vast stretches of each other’s parts. As they say the words with understanding, those words become a permanent and treasured part of their verbal repertoire. Through performing great epic stories, children learn clear lessons about the eternal battle between good and evil, light and darkness, right and wrong. They learn that it is possible to confront and transcend evil. Over the years they acquire a repertoire of heroes against whom they can measure their own efforts to lead a good and fulfilling life. They become familiar with the Four Noble Truths of Buddha, the Ten Commandments of Moses, the Eight Beatitudes of Jesus, and inspiringly instructive passages from the Bhagavad Gita. Countless times we have noted with quiet satisfaction how the children have internalized these truths, as they test them on the playground and in the classroom. Because the atmosphere in the school is respectful and supportive, the children rise triumphantly to meet the high standards we set for them. Fostering the children’s confidence is central to the success of our academic curriculum. “When I first heard about the kind of plays they do, I thought it was way too much for the kids. I don’t just mean how elaborate it is. I’m talking about the plot… I mean, we’re talking elementary school! But, as usual, the teachers know what they are doing. “The kids are thrilled to be involved in something profound, rather than the plays children often have to do. By acting it out, they truly get the point of what makes a great person great: courage, dedication, selflessness, and love. And they remember it. For years afterwards, I hear them talking about the things they’ve learned from the plays, and using what they’ve learned as a standard for their own lives. Beginning in kindergarten, the school encourages students to pursue their natural love of music through singing and learning to listen. Dedicated, skilled instructors teach voice, recorder, and guitar. 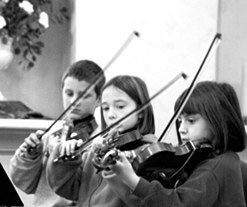 The children learn to read notes and rhythms in second grade, and in third grade they may choose to study recorder or violin. By fourth grade most students are able to play and sing in parts. Every week, all students study creative dance with a gifted choreographer. Creative dance is an artistic discipline, and much is demanded of the students. The dance program emphasizes movement exploration, invention, improvisation, and composition. The children gradually become capable of sustained physical effort while engaging their imaginations to solve creative problems. It is inspiring to watch them move with intense determination blended with pleasure of self-expression. The execution of dance movements demands that young brains learn to integrate kinesthetic, musical, spatial, logical-mathematical, intrapersonal, and interpersonal intelligences. In all grades, the students have opportunities for creation in a variety of art forms including clay, drawing, and painting. Throughout the school, you’ll see artwork created by students of all ages hanging on the walls. Students explore different media, as well as a variety of artists, to create a foundation for lifelong appreciation of all art forms. The art curriculum is sometimes integrated with other elements, especially history and literature. The students help create props and backdrops for the annual play. Over the years, they develop sophisticated skills as artists and art historians, and they become veteran museum goers. Personal poise and mature demeanor are the natural result of skills the children learn at Living Wisdom School. Lack of conflict is not what builds character; rather, it’s how we learn to deal with life’s unavoidable conflicts that defines how we will lead our lives. Small class size means that conflicts must be resolved. The classroom is thus an excellent laboratory for mastering conflict-resolution skills. When people feel sad, they often try to make themselves feel better by changing their environment. We encourage the children to recognize that they can learn to choose their responses to the world around them. What is maturity? It is the ability to relate to others’ realities, and not only to one’s own. In a school setting, there are countless opportunities to learn to be mature. We begin by being authentic with the children. We don’t look away from life’s events, including illness, divorce, family tragedy, or death. We face these inevitable challenges head-on, and soon, children gain the courage to do the same. 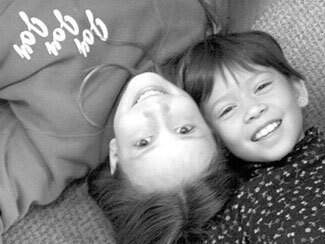 At Living Wisdom School, we encourage the children to become more aware of the needs of others. As the children experiment with kindness and unselfish behavior, we are careful to bring their attention to how much better it feels to act from an open heart. 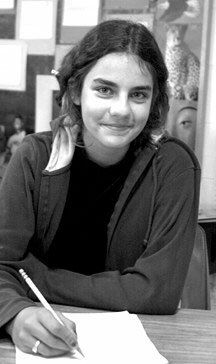 “My son is not a perfect child, but there is a kindness and gentleness he possesses that I don’t think would be there had he gone to another school. He was in an indoor soccer league last year, unrelated to Living Wisdom School. There was a mentally handicapped child on his team. 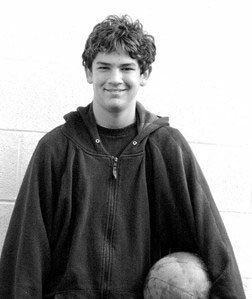 Some of the other children complained about the presence of this child on the team because he didn’t play very well. In our school, we pay a great deal of attention to ensuring that each child masters basic skills, whether it be learning the phonetic alphabet, memorizing multiplication tables, or researching a term paper. But we also devote equal time and energy to developing character traits that will help the child be successful in later life experiences. The children do very well in other educational settings, where they become known for their kindness and friendliness, for their creativity in the arts, for their leadership, and for their academics and sportsmanship. “When I think of the ways those of us who came through the Living Wisdom School program are different from others, it doesn’t come down to particular skill sets. It’s more than that: we understand energy in a different way. We all have an inner life. Some describe it as spirituality, while others think of it as a “still place within” where we can collect ourselves and gather strength to meet the next challenge. Some think of the inner life as reverence for the mystery of creation or for a higher power that intelligently guides our lives. But whatever name we give it, the spiritual dimension of life, which is so natural and obvious to most children, is fully acknowledged in a Living Wisdom School classroom. 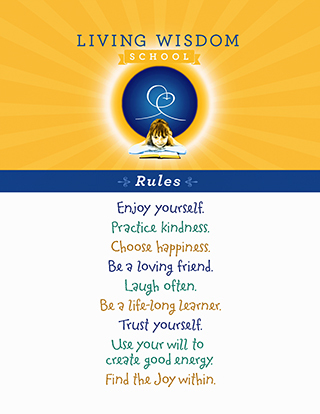 Living by spiritual values, such as inner peace, love, wisdom and joy, is emphasized in all aspects of school life, and all religions are honored. 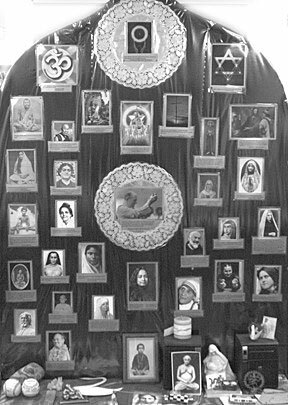 Each Living Wisdom classroom has a universal altar on which are symbols of all the world’s religions, plus objects and decorations the children individually find sacred and meaningful. Every morning, we set aside time for singing, quiet meditation, affirmations, prayer, yoga postures, and other activities that help uplift the child’s consciousness. When it seems appropriate, we point out that certain attitudes and actions increase the children’s inner sense of well-being, while other choices take it away. Many parents have told us how much they wish they had been encouraged to learn these lessons when they were young. Children from Living Wisdom School have done very well, both in public high schools and in highly rated college preparatory high schools such as Menlo School, Harker, Presentation High School, San Domenico, St. Francis, Archbishop Mitty High Schools, and Crystal Springs Uplands School. One fifth grader who transferred into a large middle school is about to publish her first children’s book. A student from the Netherlands astonished us when she returned to her homeland and scored the highest in her class on the rigorous Dutch national examinations, even though she had arrived at Living Wisdom School the previous year with no knowledge of English. Alumni from the first Living Wisdom School in Nevada City, California have graduated from, or are presently attending the Juilliard School, Stanford University, Georgetown University School of Law, UCLA, UCSC, UC Davis, UC Irvine, UC Santa Cruz, Loyola University School of Law, the Chicago Art Institute, Santa Clara University, and Dominican University to name just a few. Among the school’s graduates you will find an Assistant District Attorney in New York City, a United States congressional staff member, a Suzuki violin teacher, the director of communications at an environmental think tank, a member of the San Francisco Opera Chorus, an Education for Life teacher, a grant writer and fundraiser for CARE, and a commercial airline pilot. Our teachers are authentic, and the children sense it immediately. The teachers express in their own lives the positive attitudes, spiritual and moral values, and maturity that they seek to develop in the children. They are actively committed to their personal and spiritual development. They meditate regularly, and practice the principles of emotional self-mastery that form the foundation of our educational approach. The teachers of Living Wisdom School are able to see the unique gifts in each child and to celebrate them in a hundred ways in the course of the school day: by encouragement, positive affirmation, challenge and support, celebration and joy. They understand that fine teaching is an art and a science, driven by inspiration, not coercion. They focus on the positive, not the negative—on solutions, not problems. Creativity and spontaneity as well as discipline and structure infuse their pedagogy. They, themselves, are life-long learners. 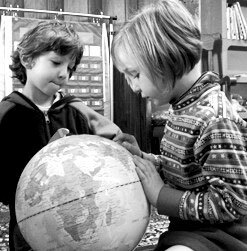 The first Living Wisdom School was founded in 1971, at Ananda Village in Nevada City, California, to meet a deeply perceived need for a more balanced educational system. So much of education nowadays is focused on the intellect, while other, vitally important aspects of a child’s character are neglected. Living Wisdom School was established to provide an education for children of all faiths that integrates body, mind, feeling, and spirit. The Palo Alto Living Wisdom School was founded in 1991. 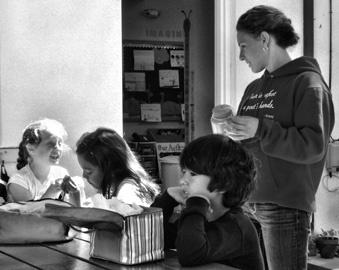 A third school was started in Portland, Oregon, in 1997. We now have schools in California, Oregon, Washington, Italy, and India, as well as an Education for Life Teacher Training degree program at the Living Wisdom College in Laurelwood, Oregon. 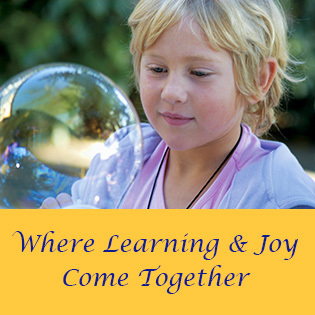 Living Wisdom School in Palo Alto is an independently incorporated educational institution. Students of all faiths and ethnic backgrounds are represented, making the school a dynamic multicultural experience for all the children. The system of education used at Living Wisdom School is called Education for Life. It is more fully described in a book of that name by J. Donald Walters, available at most bookstores or online. “The concept Education for Life can be understood in two ways, both of them intentionally so. Primarily, it is a system of education that will prepare children for meeting life’s challenges, and not only fit them for employment or for intellectual pursuits. It is also a way to see the whole of life, beyond the years spent in school, as education.